Manila, Philippines -- The biggest and most anticipated cartoon comeback of the year is about to drive animation fans crazy this October. Get ready to witness your favorite cartoon trio better, bolder and braver than ever before at the grandest and up-scale launch of the re-imagined Powerpuff Girls! 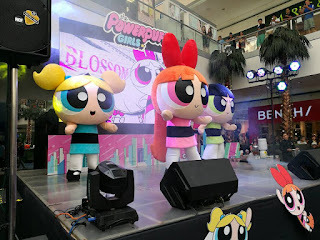 Bubbles, Blossom and Buttercup all gave their best to make the young and the young-at-heart happy during the launch of the Powerpuff Girls Merchandise at the Mall Of Asia in Pasay City. Fun and action-filled activities awaited the kids at the Powerpuff Townsville where sugar, spice and everything nice all belong. Most of those who attended have put their skills to the test in solving puzzles, bouncing thru the obstacles and throwing balls against the likes of Mojo Jojo, and other villains. The Powerpuff Girls range of toys are exclusively distributed by Richprime Global Inc., and is available at leading toy stores and department stores nationwide. Prices starts at P299. Get to know more about their products by visiting their official Facebook Page, Richwell Club and website.